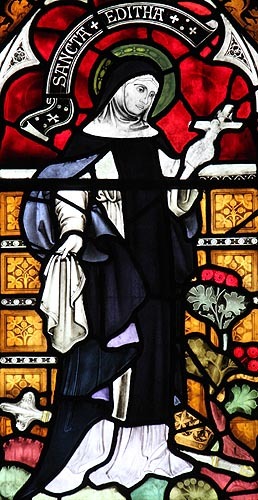 St. Edith of Polesworth was the daughter of King Egbert of England: sister of King Aethelwulf and aunt of Alfred the Great. Polesworth was one of two towns or estates granted by Aethelwulf to St. Modwenna on which to build monasteries. Edith became the first abbess there and St. Atea was one of the nuns under her care. She died on 15th March AD 871. She should not be confused with St. Edith of Tamworth who was also a nun of Polesworth in the following century.